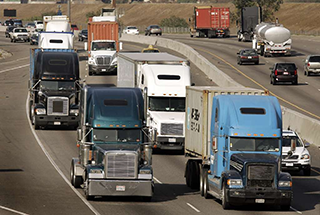 This week the Obama Administration issued its final carbon emissions standards for big rigs. That means that, over time, truck, engine and trailer manufacturers must design their equipment in order lower carbon emissions and fuel consumption up to 25% over the next decade. The newer trucks will cost more money due to some of the additional technology that will be required to achieve the heavy truck fuel efficiency standard. For a carrier like KANE, that has some financial implications. But the new regulations are something that we, as an industry, need to embrace. Trucks make up just 5% of the road traffic in the U.S., but 20% of emissions and fuel use. In total, the transportation sector makes up about 6% of overall U.S. greenhouse-gas emissions. We need to do our part to reduce the significant impact of the supply chain on climate change and pollution. What is impressive about the new standard is the degree of public/private collaboration that occurred during the formulation of the final rule. Make no mistake: this is government imposed regulation. But this particular standard was not developed with a heavy hand. Large shippers and truck manufacturers had an opportunity to voice their concerns in pursuit of a final rule that was both environmentally beneficial but also practical and financially feasible. There are those who will say the new rule does not go far enough – that as an industry we are capable of meeting a more aggressive heavy truck fuel efficiency standard. But the fact that engine makers like Cummins, shippers like PepsiCo, which operates the largest private fleet in America, and industry organizations like the American Trucking Association (ATA) support the new, more aggressive standard suggests we are on the right track. It’s important that shippers and 3PLs don’t wait for regulatory action to drive their own energy saving actions. KANE has proactively invested in programs and equipment to reduce our own carbon footprint on behalf of customers. And we encourage others to follow suit. We are a SmartWay® certified carrier (since 2006), which demands that we meet certain minimum standards for fuel efficiency and emissions. We have spearheaded the collaboration distribution strategy, which pools the inventory and shipments of middle-market consumer goods manufacturers so common retail customers can receive the same volume of goods in fewer, fuller trucks. We have invested in natural gas (CNG)-powered Class 8 trucks, which produce up to 20 percent fewer greenhouse gas emissions and significantly less smog-producing pollutants than petroleum-fueled counterparts. We recently updated our diesel-powered tractor fleet, which is expected to save $1.3 million dollars and 343,000 gallons of diesel annually. Is There Such a Thing As Good Regulation? Many businesses view the term “good regulation” as the ultimate oxymoron. But the latest fuel efficiency standards are a good example of government and industry working together to address a critical societal challenge. The new rule lays out an aggressive, yet realistic, blueprint for shrinking the environmental impact of the heavy trucks that are the workhorses of commerce in this country. That’s a positive step forward, for our industry and our planet.